We have a new phone number. To reach us please call 512-267-0959. 1. How much does stained glass cost? 3. How long with it take to fabricate? 4. Will you send me a catalog? 6. Do you ship your products? 7. Where can we see samples of stained glass? 8. What about privacy glasses? 9. What framing do you use? 10. How do I measure my opening? 11. How do I install your windows? 12. How do I save money on a door? 13. Do you provide insulated leaded glass windows? 14. You said all work is custom! 15. 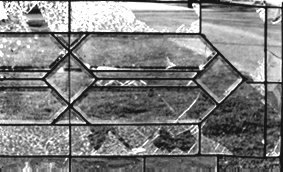 What are the components of a leaded glass window? 17. What is a bevel? 18. What is a bevel set or bevel set? 19. What is a jewel? 21. What is a gluechip bevel? 25. What is Baroque glass? 26. What about brass caming? 27. What about protecting my children and/or pets? 28. Won’t someone just break the glass and walk right in? 29. I don’t think that I like the bars going across the door window. Gluechip is a colorless textured glass which affords a moderate amount of privacy. Any colors you see are whatever the camera saw; i.e., the sky and trees behind the glass. Double Chip Gluechip. More privacy without the frosted effect. Flemish, Double Chip Gluechip, and a pencil bevel. What is a Bevel Set/Cluster? A BEVEL is a piece of glass which has had its edge on one side ground to a slant and is then polished back to clear. A grouping of several bevels is referred to as a "BEVEL SET" or BEVEL CLUSTER that are the design which is the focus of the window. The colors you see are whatever the camera saw behind the glass. What is a Gluechip Bevel? A Gluechip Bevel is one which is cut from a piece of gluechip glass, had its edge ground to a slant and then polished back to clear. A grouping of several bevels is referred to as a "bevel set" or Bevel Cluster which makes a design that is commonly the focus of the window. 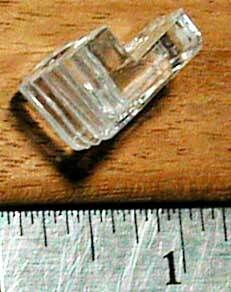 Pictured here is a Gluechip Bevel with gluechip glass surrounding it. The colors you see are whatever the camera saw; i.e., the sky and trees behind the glass. Waterglass affords some privacy and adds a beautiful texture to your window. Waterglass comes in many colors; however, the glass shown here is clear. The colors you see are whatever the camera saw behind the glass. 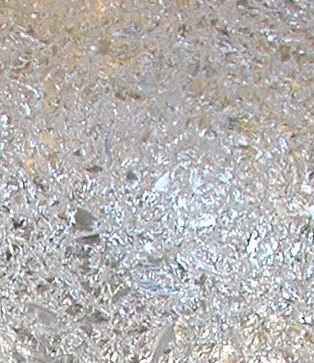 Flemish is a texture commonly found on glass blocks. We use it primarily for the borders of our windows. A "bevel set" or bevel set is a grouping of several bevels to make a design which is usually the focus of the window. Pictured here are two bevel sets, one glue chip and one clear. Baroque swirls. Here it is pictured with a border of clear bevels. Baroque comes with clear swirls in clear glass (pictured here) and with color swirled in clear. Antique has gentle lines in the glass, giving it a subtle elegance. It is available in clear and many colors. They come in different colors and sizes; also shapes. All orders are taken over the phone. We see no need in an expensive "shopping cart" system, because we will need to consult with you regarding your order. Please DO NOT send us your credit card information in an e–mail. We accept Visa and MasterCard or checks. Our terms are one half when we begin the order and the balance just prior to shipping. Since we must pay for your door up front, we cannot cancel any order for a door. It depends on what we have lined up before you. We can usually ship within 6 to 8 weeks. Add 2 weeks for insulated windows. All windows begin with a metal frame – shown here as – is normally ½" wide (which accounts for 1" of your window dimensions). You may see a photo by scrolling down to the next section. 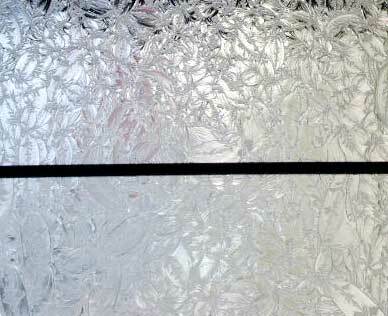 A border of a different color or clear texture – shown here as –– normally 1", 1 ½", or 2", depending on the size of your window. Waterglass or Flemish are good choices for borders. You may see both on this page. 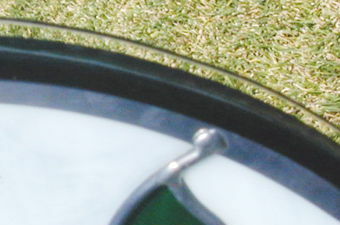 The field or background glass – shown here as . You might have noticed the size varies here for demonstration purposes. We make the "bevel set" fit by adjusting this area of your window. See some options like gluechip and Waterglass by scrolling up to the previous sections on this page. Bevel set/bevel set – center design shown here in white. You could replace the "bevel set" – or any of the other parts of the window – with colored glass if you wish. Bevels can be viewed by scrolling up to the previous sections on this page. 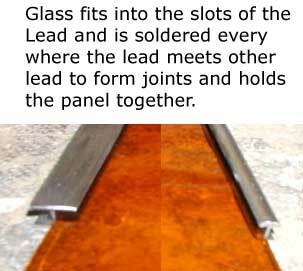 Lead is the skeletal structure of your leaded glass window. Glass is cut by hand to the desired shape and fitted into a piece of metal called "came" of various shapes and sizes. 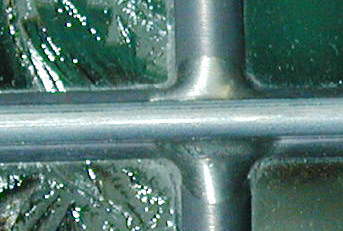 These are pictures of "H" came (looks like an I–beam) which accepts glass in the slots on either side. For most applications, the face of the outer frame is 3/8" or 1/2". 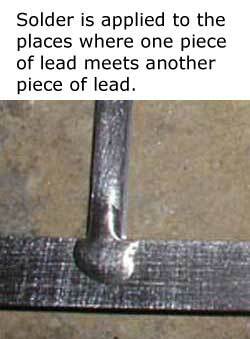 Inner lead can be 3/16", 1/4", or 3/8" on the face. For measurements, we suggest you measure the actual opening and then subtract ¼" off the width and 1/8" off the height to arrive at the actual "build size." How should I measure the opening? The brown represents the finished opening that you will set our glass window into. Measure the height and width in several places. Measure the diagonals to verify that the opening is square. You now know the dimensions of the Actual Opening. Deduct one–quarter" off the width and one–eighth" off the height and you have our "Build Size." This is a great way to save money on a door. Solid slabs are inexpensive, and after the leaded glass is installed, it is difficult to tell the difference between a slab and a custom solid wood door. Using a 2 x 2 cut down to the same thickness as the door, a slot is cut down the center to accommodate the metal frame of the leaded glass. 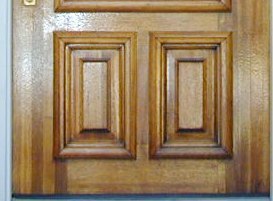 A molding is applied across the joint on both sides where the 2 x 2 meets the opening in the door. This molding holds the leaded glass in place and hides the gap where the door and the 2x2's meet. Stain or paint the door as you wish. Remember: slabs are veneer, so ensure that the edges are well sealed. How can I install your windows? You can do this several ways. The first picture shows how a leaded glass window might be installed in an interior opening. The brown "F" is the sill itself. The tan "G" is the interior molding which holds the window in place. The gray "C" is the ¼" thick metal frame which is around every window we fabricate. The blue "D" is the leaded glass. 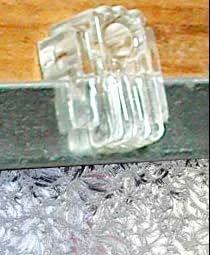 This shows how a leaded glass window might be installed in an interior opening with simple mirror clips. This works well with cabinet doors or if you are attaching a window over the sash of an existing window. 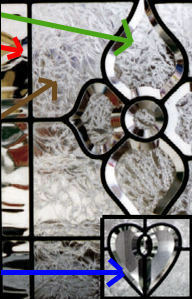 The second picture shows how a leaded glass window might be installed on the interior ledge of an existing insulated double or triple pane glass. The cream "G" is the sill/ledge. The brown "F" is the interior molding which holds the leaded glass window in place. 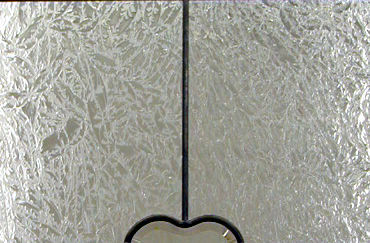 The gray "C" is the ¼" thick metal frame which is around every leaded glass window we fabricate. The pale blue "J" is the exterior insulated double or triple pane glass. 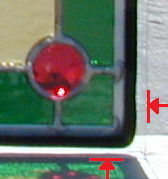 The third picture shows how a leaded glass window might be installed on the interior side of a single pane of glass. The tan "G" is the interior molding which holds the leaded glass window in place. The pale blue "J" is the exterior glass. 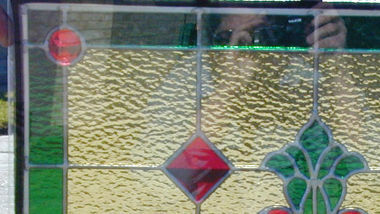 The fourth picture shows how a leaded glass window might be installed in an exterior situation. The yellow "A" represents a silicon bead to keep the weather out and cushion the leaded glass WINDOW Feel free to run it under the window, also. The "H" is the exterior molding on your sill or, in some instances, a putty bead. The fifth picture shows installation of an insulated window. The tan "G" is the interior molding which holds leaded glass the window in place. 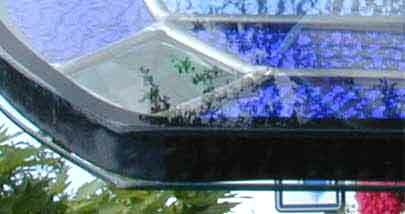 The blue "E" is the tempered glass on both sides of the leaded glass window. The Green "I" is the gap before the insulating seal. The Red "B" represents the black seal for the insulated unit. Do you provide insulated leaded glass windows? We can insulate almost any size window using 1/8" tempered glass on both sides of the ¼" thick leaded glass window with an inset black butyl seal. 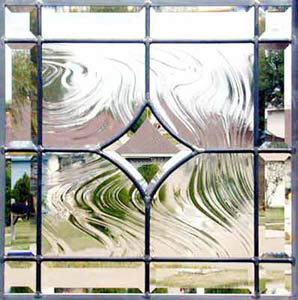 Helps protect leaded glass from possible breakage. 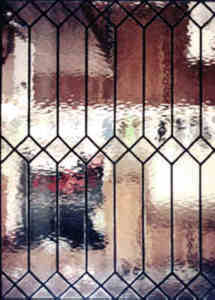 Stabilizes leaded glass window without the use of traditional rebars which could interfere with the design. 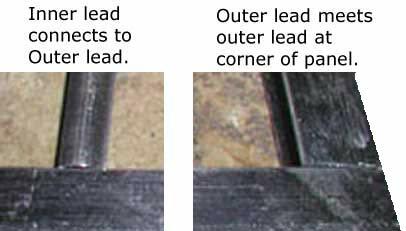 Prevents oxidation and aging of leaded unit, keeping it in its original pristine condition until the seal fails. Eliminates leakage associated with single glazed leaded glass. A biggie is the glare you get off the insulating glass on both sides of the window. If we do not get a photo of the window before it is insulated, we can forget it. In time the seal will leak. The window will cloud and the moisture and dust can actually etch the leaded glass. Also, it is difficult to find someone willing to take apart the 3–piece insulated unit, clean it up, and have it resealed. Our leaded glass window set against 2 pieces of tempered glass that are sealed as a unit which many residential glass companies can provide for you. 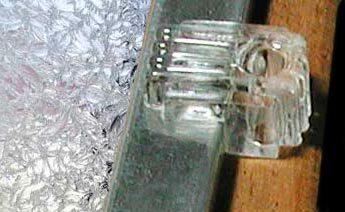 This has several advantages over an insulated leaded glass window, with no cons. When the seal fails (yes, it is just a matter of time), (example) the insulating glass can be replaced without affecting the leaded glass window. If the outer insulating glass is cracked or broken, hopefully the damage will not travel through both pieces of insulating glass to break the leaded glass. There is no glare on the interior view of the leaded glass window that you would have if it were sealed between 2 pieces of glass. Most residential plate glass companies can provide and install the insulated glass before the leaded glass arrives. There is no glare on the inside view of the leaded glass window that you would have if it were sealed between 2 pieces of glass. New leaded glass windows turned into triple glazed insulated units. Existing single glazed units turned into insulated units, eliminating leakage and structural problems. Fragile antique windows turned into functional exterior units. Decorative windows for wine cellars, shower stalls, etc. Etched and glass–on–glass units permanently protected. Repairs of existing insulated units. From the edge inward you will see some clear glass, the black butyl strip which forms the insulating seal, and our metal, totaling approximately 1". This should be covered, all or in part, by the moulding you will use to secure the window into its opening. You will notice a glare on the insulating glass. The photographer shows up clearly in this shot. butyl seal on the outside of our metal frame. We ship to anywhere within the USA. We normally use ABF and FedEx, so if they go to your town/country, we can probably ship to you. You are responsible for all taxes, duties or other surcharges, i.e., Canada, etc. If you have a carrier you want us to use, please advise when you place your order. What about brass or polished nickle or other stiff metal caming? Brass came can be solid or "brass capped" over lead. There are several problems with this product. 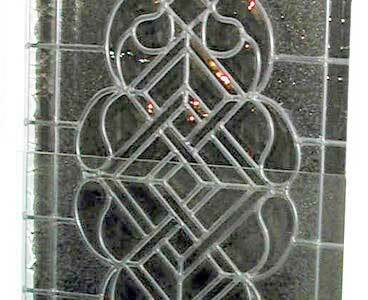 Solid brass is like zinc came in that it is not flexible, which causes the solder joints to be the weakest links in the window. They break! Furthermore, these metals tend to break down over time. Another problem is that there is no brass solder; therefore, the solder joints either remain silver or are painted gold. To make matters worse, brass tarnishes, but the painted solder joints do not, so they stay bright gold while the rest of the came darkens. Insulating your window will protect it from tarnishing until the seal fails. How much does stained glass cost? Because all windows are built custom to your specifications, we do not know prices until we know what you want. The size and complexity of the work dictate the price. Our pricing begins at $205 per square foot not insulated and $245 per square foot insulated, if you need a ball park estimate. The more intricate the design, the higher the price. Inches Width x Inches Height divided by 144 equals the SQUARE FOOTAGE. As you view the pictures, remember: you choose your own colors and sizes for your window. We can use your design or adapt ours for your window, but each window is created to fit your size specifications and colors. To inquire about pricing, we need to know which design you like and the dimensions you need the window to be. To inquire about a design, note its name and the dimensions you need the window to be and email your inquiry to us. We will be happy to work with you to make the design fit your needs. Where can we see samples of stained glass? You may view samples of the entire line of Spectrum Glass here >>> Spectrum Glass. Same window; same day; different times. From morning to evening, the colors and appearance of your stained glass window will change. Trying to find the exact shade of a color is futile. Can you live with muntins behind your stained glass? Only you can decide. You might elect to change out the existing glass with a sheet of plate glass without muntins. In this instance, that is a sliding window behind the stained glass, which casts a larger shadow than most muntins. 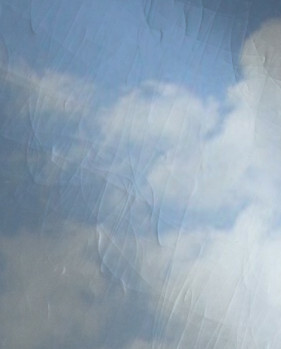 You may view more samples of obscure glass here: Hollander Glass >>> VIEW IT! Please use your BACK button to return to this page. 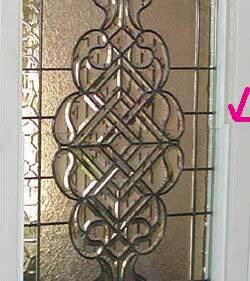 Advise your builder you want to upgrade your front door to mahogany with leaded glass. The perfect time to change that entry and increase curb appeal to your home. Give your old door a face lift with a new glass window. A leaded glass door will help close the sale. After looking at many houses, a beautiful door helps people remember your house and that stained glass window will certainly add value to your home. Dress up a drab corner. Cover that black hole with a piece of glass art and set a light behind it. Cool! A beautiful alternative to drapes and shutters, and you don’t have to dust or send them to the cleaners! Hide that unsightly fence. A glass window is perfect. Stained Glass gives lasting beauty to the discriminating homeowner and gives your home a unique identity among those of your neighbors. Will you send me a catalog? This Web site IS our catalog. Since every glass window we build is custom designed to someone’s specifications, this makes a catalog an impossible task. The costs involved in printing a color brochure are quite high, and which pictures would we include? We have over 600 pages with pictures here online for you to view. To inquire about a design, note its name or number and e–mail your inquiry to us. We will be happy to work with you to make the design fit your needs. You indicate that all work is custom! The windows pictured on this site have been sold. All work is custom. You will receive a new window built to your sizes and colors. 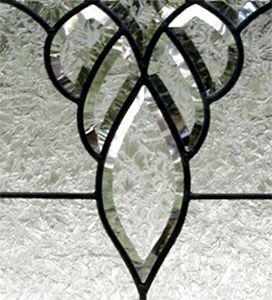 Our leaded glass windows are handcrafted in Texas to your specifications. Most any glass window can be insulated. Choose your own colors and sizes. Most designs can be enlarged, but few can be reduced by more than 10 percent without design changes. Please do not ask us to replicate a 24" x 70" in a 8" x 10.5" window! That is the size of a piece of printer paper! In many instances, we list the size of the bevel sets or the window itself to give you an idea of the proportions of what you are viewing. I am not sure I like those bars going across the door windows. We put them on all door windows and on larger windows that are not insulated. Rebars will add years to the life of your window. Ask anyone who repairs them! Some shops don’t use them and/or charge you extra for them, but we want to give your window every chance for a long life. Some people absolutely refuse to have them put on their windows. So be it, but we advised you against it! Rebar attached to window adds strength. Rebars are affixed at horizontal intervals on windows over 22". 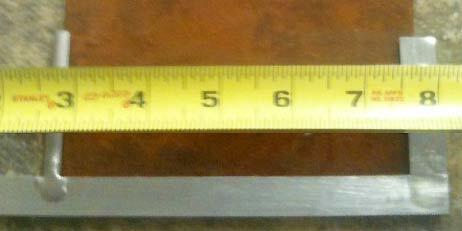 The size of this rebar is 1/8" x ¼", with the narrow edge facing the viewer. 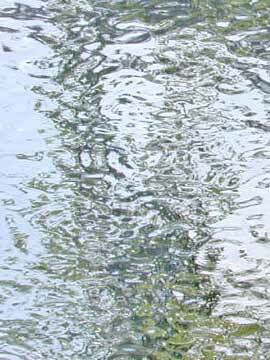 This is a view of a rebar looking directly at its edge. We don’t want it to interfere with the beauty of your window any more than necessary. I don’t want my dog to jump on the leaded glass and hurt himself or break the glass window. For these large sidelights, we set a piece of ¼" thick tempered glass on the interior ledge of the leaded glass windows, but only as high as the dogs might be able to reach. Now nose prints are easy to clean, the delivery guys are safe, the leaded glass is safe, and so are the dogs. You have to look closely to even notice the odd piece of glass. We tweeked the second picture so you could see the glass better. For very young children, placing a pane of tempered glass to cover the entire window with is your best solution. Won’t someone just break the glass and walk right in? This glass window took quite a beating. The broken glass is held in place by the original putty cement; the metal structure is still in place. There is an easier way into your home than through a leaded glass WINDOW. Check out your window panes which are held in place with a little strip of plastic moulding. Like any glass window, if someone wants to throw himself through it, he will probably wind up inside, bleeding all over your floor. My new glass window has an ugly scratch on it. Some suppliers maintain "Industry Standard" dictates that if you cannot see a scratch from 3 feet away, it is acceptable. Some folks will use any gimmick as an excuse for poor quality. We believe that the beveling in a window provides all the glitter needed to be gorgeous; scratches only interfere; therefore, we insist on the very best products for our customers and expect you to accept nothing less! My door looks like a butcher block with several small pieces of wood glued together. Will they split apart? It happens. That would be the weakest link. Our doors are neither laminated (some door manufacturers will cut costs by gluing together smaller pieces) nor veneered (thin sheets of wood glued over a cheaper core). They will not peel and do not have all those glued joints of the laminated together doors. We value our reputation too much to sell anything less than the best. I’ll save money with the laminated or veneered doors. No way! Do not lose sight of the fact that the cost of the door is actually a fraction of the total installed price; and the cost of hardware, installation, and finishing is the same for a cheap door as it is for a door of quality. A cheap door will cost much more in the long run. If you are fixing up a house to unload it, you can go cheap if your conscience will let you, but if you plan to live in this house for more than a couple of years, don’t skimp here. The guy said his doors are mahogany. Mahogany comes from South America and Africa. The softer woods coming in from the orient can claim mahogany all they like, but if you care about quality in a solid hardwood door, mahogany is superior to other woods, finishes beautifully and holds up better to the ravages of the weather. We are using mahogany from Africa but will use whatever your want. 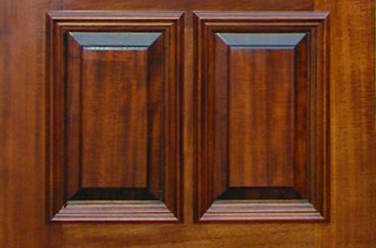 This is a picture of one of our mahogany doors. Website designed, built and maintained by Marian Eide. 1997 – Present Glass by Design – All Rights Reserved.